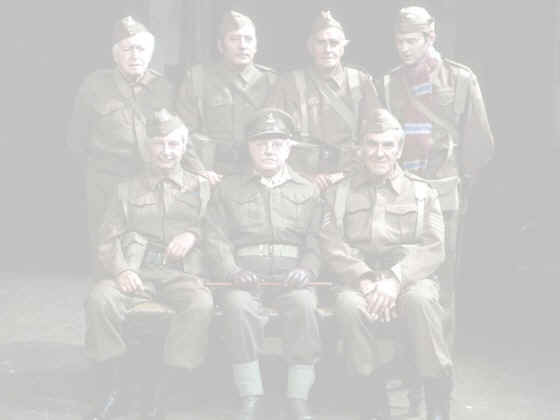 This programme was screened on August 3rd 2008 as part of the Dad's Army 40th Anniversary celebrations. It was the pinnacle of a series of programmes and events held for the occasion. The Coldstream Guards march onto the stunningly recreated set of Walmington On Sea church hall, followed by the host Jonathon Ross. Also recreated for the show was Mainwarings office. Ian Lavender (Private Pike) sits and talks with Jonathon Ross. Old foes. The German U-Boat Commander (Philip Madoc) and Private Pike. Celebrities John Thomson and Ronnie Co rbett recollect their memories of the show. Dad's Army stalwarts Chief Warden Hodges (Bill Pertwee), Mrs Fox (Pamela Cundell) and the Rev. Timothy Farthing (Frank Williams). And of course, without whom, the creators themselves, David Croft and Jimmy Perry. They were both presented with a commemorative picture of the old Dad's Army comic strip. And just for fun, Jonathon Ross, John Thomson and Dan Snow are put through their drilling paces. A special video link message from Lance Corporal Jones (Clive Dunn). The whole crowd say Goodbye.